It’s in the records on Ancestry.com family tree hints. So what I’m I going to do with it? 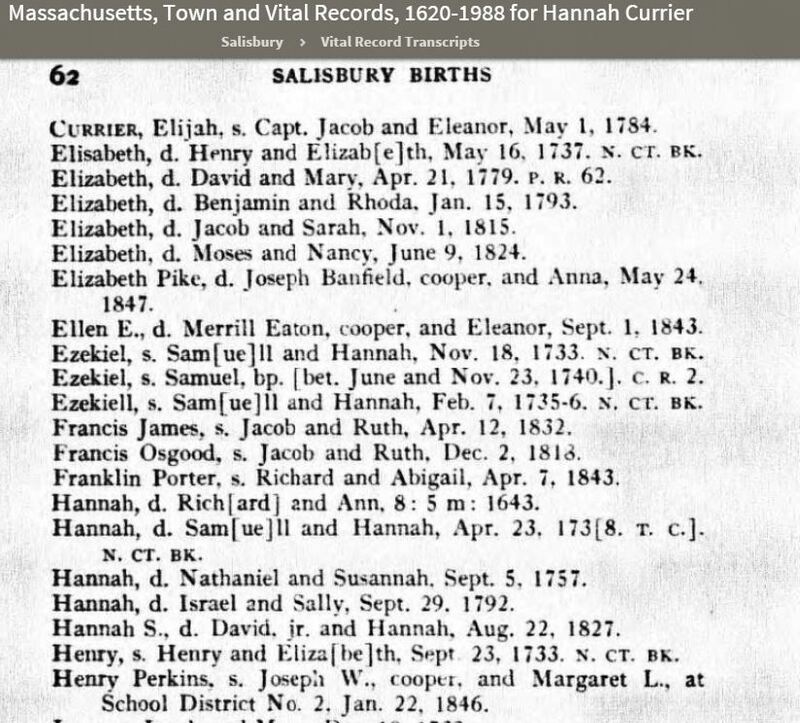 This is a record hint for Hannah Currier, my 9th great grandmother, from my Ancestry search. I know right away it is not an original document but a transcription. I know that because it is not handwritten. No typewriters in 1643 that I’m aware of. That doesn’t mean I will discard this record, there is a lot of mining I need to do on this record. What questions I ask myself when mining a new record for information. Which Hannah Currier is mine? Where is the original records? For the answer to Question #1, I can look at my family documents from my direct ancestor that was her child. (I start my research with myself and work backwards.) In this case it was John Foote. I know my Hannah was born in 1643. The first Hannah listed as the daughter of Rich[ard] and Ann, 8: m: 1643. If you notice other records on the page have abbreviations next to the dates. I now go to the bottom of the page to the page numbers and go to page 1. I capture a screen shot of the Title page and the printing company page, if not the same, for future source citation and documentation back up. I save the image in both my Location (Salisbury) and Surname (Currier) folders. I also take a screenshot of each Abbreviations pages and add them to the folders. The abbreviations tell me where the information for the birth date, in this case, came from. 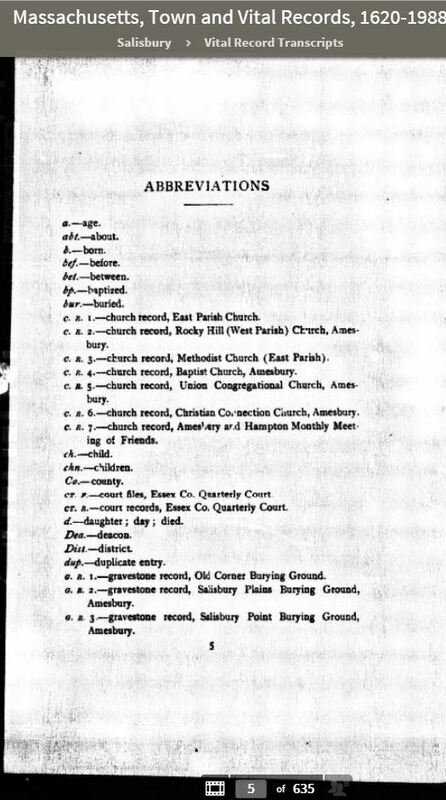 That gives me the clue of where to search next, Church Records (Which Church), Town Records (Which Town), Court Records, County Records, Cemetery Records are just a few noted on the first page. Salisbury has 7 pages in the group of record transcriptions. For Question #3, I proceed in several ways in finding the originals. I will search on line at Familysearch.org Massachusetts Records. Family Search is a free online database supported by the LDS Family Search Centers. I would also search online with Google Search, and other Genealogy databases that are on line. If I cannot find anything on line, I know in the New England states, my area of knowledge, I need to go to the town, county or state level in person. A genealogy road trip will be in my future. The answer to all these questions are tracked in my Microsoft Word document for the person, Hannah Currier, in the case; links are recorded in both Microsoft Word and my Excel research log; and all my research are kept in notes, media and sources in my FTM2014 Family Tree for Hannah Currier. If I’m working on records that I’m not sure belong to my Hannah Currier, I keep the Word Document, media and links in a Surname/Maiden sub folder Currier Hannah unknown relationship, until I can prove or disprove the relationship to my Hannah Currier. Sometime my Ancestry Tree hints involve a public story. I DO NOT take the story as fact until I verify the information. It is kept in the Unknown Relationship folder and save in my shoe box on Ancestry. Those stories often provide clues of where I can research next. In this case I would find the “Genealogy of Richard Currier of Salisbury and Amesbury, Massachusetts, (1616-1686/7), and any of his descendants by Harvey Lear Currier. Massachusetts Vital Records Ancestry.com Ancestry.com. Massachusetts, Town and Vital Records, 1620-1988 [database on-line]. Provo, UT, USA: Ancestry.com Operations, Inc., 2011.